On this site you will find news and information about the society's programs and activities, copies of our newsletters, a goldmine of resources in our Archives and Links sections, and many other items of interest. 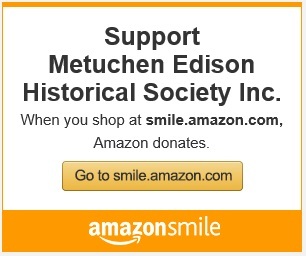 The Metuchen Edison Historical Society is a nonprofit corporation organized under the provisions of Section 501 (c)(3) of the Internal Revenue Code. The mission of the Metuchen-Edison Historical Society is to stimulate and promote an interest in and an appreciation of the history of the geographic area in and around the Borough of Metuchen,and the Township of Edison in the County of Middlesex New Jersey. To fulfill this mission, the Society shall foster the creation, collection, preservation, and maintenance of physical material related to the history of Metuchen and Edison, make the material available to the public in various formats, and increase public awareness of this history. The MEHS archive is located in the Grimstead room of the Metuchen Public Library, 480 Middlesex Avenue, Metuchen NJ. If you have an interest in a particular area of Metuchen or Edison history please let us know (info@metuchen-edisonhistsoc.org) as specifically as possible what that interest is. If we have relevant information, we will invite you to visit our archive located in the Grimstead Room of the Metuchen Public Library. Although our archives are not conducive to browsing we would be please to arrange by appointment for one of our Board members to be present to assist you with your search. Click here for a membership form or visit our Membership page to join and pay online. We are now on Facebook! It's a great place to ask questions about the Metuchen-Edison area and keep up with news and events.